Jet Black Kiss (How cool is that name?) is a Los Angeles-based alt-rock act that is the brainchild of producer/engineer/songwriter Robert S. Liam (aka – “Simon”). From what it appears, Jet Black Kiss is very much a one-man project in the studio (this is Simon’s second release as JBK) but there is a full backing band being put together for live shows. Jet Black Kiss is recommended for fans of My Chemical Romance, Stone Temple Pilots, Smashing Pumpkins and Motley Crue. That sounds about right and I would even add Filter and the Nikki Sixx/Tracii Guns “supergroup” Brides of Destruction to that list. Simon has put together a nice collection of alternative hard rock songs that have been spiced up a bit by glam, ’70s punk and goth rock. I’m often bored by alternative rock but on this release there’s enough melody and hooks to keep this self-titled effort interesting. Had Jet Black Kiss been around in the late ’90s, I can see a number of these songs making their way to radio and airing alongside Filter, Tool, Nine Inch Nails and Stone Temple Pilots. 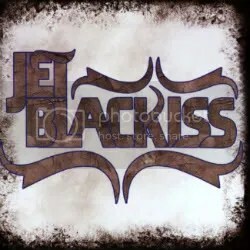 This isn’t a retro release but this type of alternative rock isn’t heard much from anymore and Jet Black Kiss certainly doesn’t fit into the mind numbingly generic “post-grunge” genre that unfortunately still dominates modern rock radio. There are a number of notable tracks but there are three songs that stand tall above all else: “Don’t Fade Away On Me” is where I get the Filter vibe, even Simon’s vocals remind me of Richard Patrick here, “We All Must Come Together” is one of the album’s heavier numbers and “Illusions” is that late ’90s hit the band could have had, heavy yet catchy. Overall, this is an enjoyable release and that surprised me considering I’m more of an ’80s rock/metal-head. Simon & Jet Black Kiss are an outfit I’ll be keeping an eye on for future releases and this release is well worth checking out for fans of any of the other bands I mentioned.